I often hear friends say that culture shock is not arriving into a foreign country, but coming back to the U.S. I think this is true. In so many ways Americans are the exception to the norm. From the way we shop, drive, and disinfect everything, its clear that the U.S. does not belong to the rest of the world. Coming back from Yelapa has been a difficult transition. At my mom’s house in San Diego, I wake not to the sunlight streaming across my breezy bed but four dark walls. No frogs jump across the house, as they did in our palapa. No ants clean the counters. No stray dogs wander in. And there is no one beating the juice out of coconut with a machete in the dining room. I keep shaking my clothes for scorpions, throwing TP in the trash, and saying ‘hola’ instead of ‘hi.’ I guess it’ll take a while to fully realize that I’m back. But, alas, I am. Case in point: yesterday my mom and I went to IKEA to buy stuff for my van. As I looked through storage bins that would slide under the bed in my van, couples my age fingered linens and selected dishware to fill their first home together and it struck me how “off schedule” I am. I guess I should be settling down by now. Strolling through the aisles, I felt a surge of affection for my mom, who is so supportive of my choices, who has never once made me feel bad for not having children yet, or a house. Later that day she even helped me remodel my van. It now dons a leopard print bedspread, red velvet pillows, yellow LED lights, posh rug. Like a Manhattan apartment on wheels. Today I start up the coast, stopping at flying sites along the way. Santa Barbara, Big Sur, Pacifica. In Oakland I get to spend some time with my travel writing hero: Jeff Greenwald (www.jeffgreenwald.com). Jeff writes articles for lots of magazines and has written some very funny books about traveling the world. He also started the nonprofit, The Ethical Traveler, an organization that encourages people to travel with environmental and cultural awareness. Check out the site: www.ethicaltraveler.org. Oh yeah, and Jeff’s 2008 resolution is to learn to paraglide! Back in Ashland, I have a job writing sections of the Oregonian’s wine guide and will hopefully find my way to more freelance jobs. 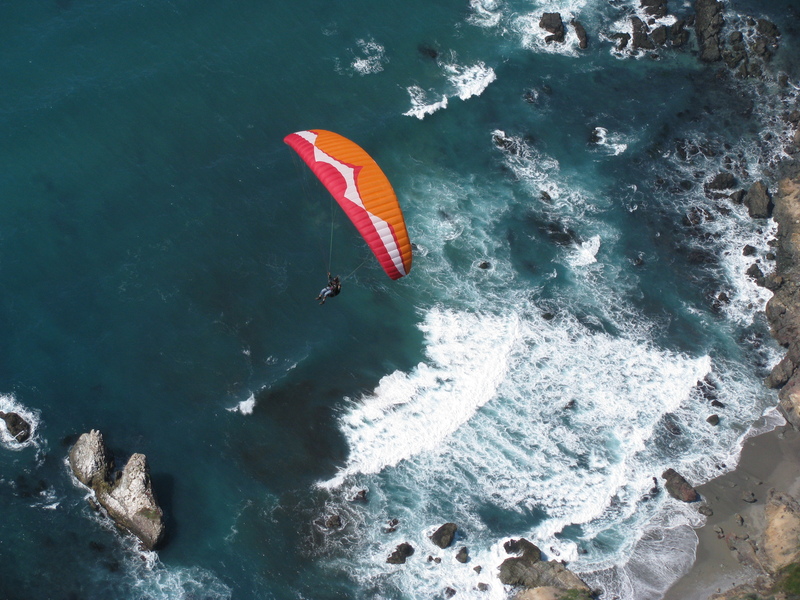 I will miss paragliding in margaritaville, but it’ll be great to see friends again and get the last of the spring skiing (and the first of the flying season at Woodrat! ).